A compact all-in-one lens that's ready for anything. If you're looking for an outstanding grab-and-go lens—the kind you'll keep on your camera for nearly every situation—check out the new AF-S DX NIKKOR 18-140mm f/3.5-5.6G ED VR. Optimized to draw full potential from Nikon’s high-resolution DX-format image sensors, it delivers beautiful ultra-sharp photos and videos with softly blurred backgrounds. Its versatile 7.8x zoom range (18mm to 140mm) lets you shoot everything from wide-angle family portraits to telephoto close-ups on the sports field. 4 stops of VR image stabliization means sharper handheld photos and video, especially when shooting in low light or at maximum focal length. You can even get as close as 45.1cm from your subject for macro-style close-ups! Developed with high pixel count D-SLRs in mind, the AF-S DX NIKKOR 18-140mm f/3.5-5.6G ED VR delivers vibrant, detail-rich photos and videos across its entire zoom range. Zoom out for an 18mm wide-angle view that’s great for group shots, landscapes or any time you need to fit more into the frame. Zoom in for 140mm of telephoto reach—enough zoom to capture close-ups of your favourite player from the sidelines. In between, you have standard views similar to what you see with your eyes and medium telephoto views ideal for portraits. Whatever shot comes your way, you’ll be ready to catch it. The AF-S DX NIKKOR 18-140mm f/3.5-5.6G ED VR versatility is strengthened by 4 stops of VR image stabilization. Capture sharp, shake-free handheld photos and videos in low-light situations, when you want to use slower shutter speeds, and at telephoto distances, when even the smallest amount of camera shake can ruin a shot. 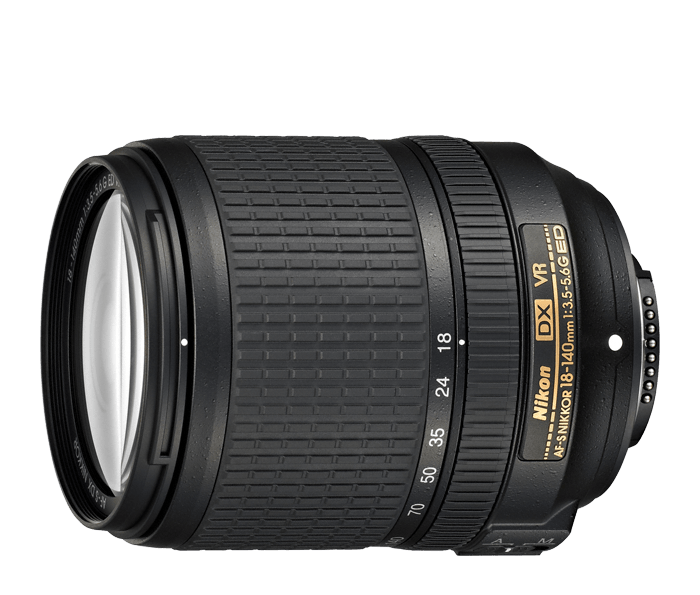 AF-S DX NIKKOR 18-140mm f/3.5-5.6G ED VR is an advanced lens designed to get the most from high-resolution Nikon D-SLRs. In addition to VR image stabilization, it uses ED (Extra-low Dispersion) glass, which virtually eliminates reflections and lens flare for better contrast and Aspherical (AS) lens elements for minimizing aberration and improving image integrity and colour. Nikon’s remarkable Silent Wave Motor (SWM) provides ultra-fast, ultra-quiet autofocusing, a major advantage when recording video. And, of course, the AF-S DX NIKKOR 18-140mm f/3.5-5.6G ED VR has NIKKOR’s renowned quality of construction and outstanding optics. ED Glass is an optical glass developed by Nikon that is used with normal optical glass in telephoto lenses to obtain optimum correction of chromatic aberrations. Super ED glass exhibits an even lower refractive index and lower light dispersion than ED glass, while excelling at eliminating secondary spectrum and correcting chromatic aberration. A-M stands for Auto-Manual Mode.